We are off to a great start with the 2018-2019 academic year! Students have been on campus for approximately 1 month and they are excited, anxious, and curious to see what the semester holds. This newsletter includes information regarding Colonials Weekend (Family and Alumni Weekend), Student Success Workshops, the Fall 2018 Career and Internship Fair, Colonial Heath Center updates, student involvement and residential life. Please do not hesitate to contact our office at 202-994-6710 or via email at [email protected] if you have any questions or concerns. You should also follow us on Facebook and Twitter for important updates. We look forward to seeing you next month! Have you registered to attend Colonials Weekend? Join the GW community on October 26th-28th for a celebration of alumni, families, students, and friends! This fun-filled, event-packed, memory-making weekend includes the Colonials Weekend Kickoff Party, GDub Madness, President's Welcome Address, Dean's Receptions, "Classes Without Quizzes" Faculty Lectures, Taste of GW, Vern Harvest, and the Colonials Weekend Jazz Brunch, to name a few. Click here to register and to view the tentative schedule. We know GW students are busy. We also know that students can gain benefits from attending a few Mental Health Discussion Series (MHDS). The MHDS is a weekly, hour-long discussion, designed for students to collectively meet with a counselor and discuss various topics. These discussions are free and no registration is required. Click here to view the schedule. Wednesday, September 26th from 11am-3pm in Gelman Library 219. The vaccination is fully covered for students with the Aetna Student Health Insurance Plan (SHIP). For students without SHIP, $25 will be charged to their student account. September 27th from 2-3pm- Student Health Insurance Plan Overview. Click here to access the webinar. October 17th from 3-4pm- Colonial Health Center Overview. Click here to access the webinar. 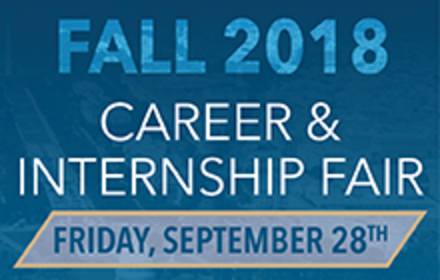 The Fall 2018 Career & Internship Fair hosted by the Center for Career Services is scheduled Friday, September 28th from 11am-3pm at the Charles E. Smith Center. This fair provides opportunities for GW students and alumni to meet with organizations from a variety of industries that may be recruiting for full-time, part-time, and internship positions, and/or getting their brand out to the attention of GW students and alumni. Students can RSVP thru Handshake. Each semester the Office of Student Support and Family Engagement (SSFE) offers a series of Student Success Workshops that help students improve skills, learn about support resources on campus, and get to know tips and tricks for making each semester successful. Encourage your student to attend the next workshop on October 1st from 5:30-6:30pm in Gelman 219 (Topic: Communication 101). Students also have the option of scheduling one-on-one appointments with a staff member to discuss the various topics. Click here to view the Fall 2018 semester workshop schedule. Disability Support Services (DSS) is committed to working with students with disabilities to ensure equitable access during their undergraduate experience. That access is often facilitated through the implementation of formal disability accommodations. Encourage your student to self-advocate by disclosing their disability and providing documentation in a timely manner. Additional information about DSS, registering, and the required documentation can be found by clicking here. The more students view college as an opportunity to broaden their horizons and develop their interests, the more likely they are to succeed. A part of experiencing college life is to be involved and active outside the classroom where they can take advantage of those #OnlyatGW moments such as performances at the Kennedy Center, lobbying for legislation on Capitol Hill, team practice in front of the Lincoln Memorial, etc. Through the Center for Student Engagement, students can join over 450 student organizations. and pursue their passion while building our campus community. Students can also further enhance their college experience by getting involved in our various leadership programs or Greek Life. If a student wishes to change rooms after moving into their residence hall for the academic year, they may contact GW Housing three weeks into the semester to see if any vacant spaces are available. As there are typically a limited number of vacant spaces on campus, students are encouraged to utilize their Resident Advisor (RAs) and Residence Director (RDs) if they experience challenges with their roommates or other issues in their current living arrangement. RAs, RDs, and other residential staff work directly with students to provide advice, options, interventions, and support to address resident needs. The online FIXit system is how students initiate a request for repairs and maintenance within residence hall student rooms and common areas. FIXit is available 24/7 and is easy to use: Students login using their NetID and password. The GW Division of Operations oversees the general conditions of GW’s buildings and communicates with students about all work in the residence halls. As part of its responsibilities for residence halls, Facilities Services operates Key Depots on Foggy Bottom and Mount Vernon campuses to provide replacement keys in the event of lost or stolen room and/or mailbox keys, or room lockouts. For information on key policies, Key Depot services, and associated fees, visit Residence Hall Key Policies and Charges.